Thor arrives on board the Prometheus, where SG-1 is lost in deep space after having thwarted a hijacking attempt by rogue N.I.D. operatives (“Prometheus”). 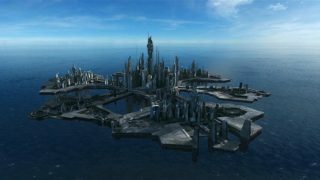 The Replicators, Thor announces, have completely taken over the Asgard home world of Halla. They need SG-1 — whose ship will be ignored by the techno-bugs, as inferior technology — to visit the infested planet and save the day. The Asgard’s most recent failed plan involved a time dilation device, Thor explains. In studying the android Reese (“Menace”), they discovered a way to signal all Replicators in the universe to come to them. Once they were all there, on the mostly-evacuated Asgard world, the time dilation device would be activated. It created a bubble around the planet in which time was slowed down by a factor of 10,000 — effectively trapping the bugs there long-term, until the Asgard could find a way to eliminate them for good. But the Replicators stopped the device from going off, and even managed to reverse its function. Now, time within the field is passing 100 times faster than normal. Thor tows the Prometheus back to Earth, where Colonel O’Neill secures the approval of his superiors for the dangerous mission. The ship’s unwanted passengers are transported to the surface, while Thor transports up weapons and supplies (including a room full of food from the S.G.C.). The Asgard then tow the ship far from Earth, to their home galaxy. The Prometheus proceeds on its own power to Halla, and lands on the surface. 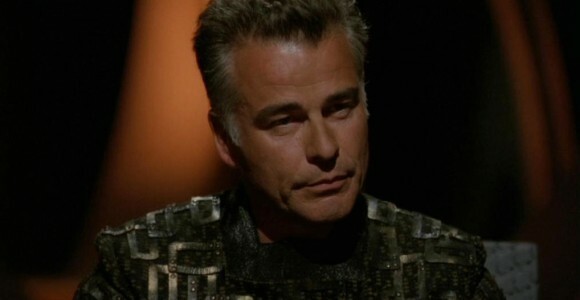 SG-1 disembarks to find a stormy, desolate world — a world covered entirely with a smooth surface of Replicator blocks. They cautiously make their way to the only structure still visible, where Carter locates the time dilation device. But before she can begin to understand how to reverse it, the team is surrounded by five humanoids. O’Neill is shocked to see humans on this barren world — until he learns that they are not human at all. They are a highly evolved generation of Replicators, who have emulated Reese and built themselves entirely out of microscopic-sized blocks — essentially, nanites. Reversing the time device has allowed them to multiply and evolve at a rapid pace. The team opens fire, but their weapons are entirely ineffective against this generation of Replicators. Their leader, First, steps toward Jack and pushes his hand through the Colonel’s forehead. He is in his thoughts, and has complete access to Jack’s memories. Three of the others likewise grab Teal’c, Carter and Jonas, and enter their minds. First forces Jack to relive the death of his son, and threatens to use it as punishment every time he does not cooperate. He wishes to see all of the worlds where SG-1 has been on their travels, in order to plan the Replicators conquest of Earth’s galaxy. The team awakens on board the Prometheus. Major Carter learns that Fifth, a young-looking and wide-eyed Replicator who is clearly not like the others, carried them all back there to rest after their experience. Now, the Replicators have invited them all back to the structure for dinner. When they arrive, the Replicators explain themselves. First was created in Reese’s image, and was the one who stopped the Asgard device; his nanite technology allowed him to reach through a hairline crack in the device’s casing to stop it before it activated. After replicating more like himself, the creatures attempted to correct the flaw in Reese’s programming and create a Replicator who is more human. Fifth was the result. But he is now considered inferior to them because of his emotional “weaknesses.” He was the only one who did not invade the team’s minds, and First insists that he take his turn. Carter sees that Fifth is reluctant and conflicted, and volunteers herself. Fifth reaches gently into her mind, and Sam finds herself standing with him in the middle of a storm. It is not a place from her mind, Fifth explains, but from his. They may speak for a few moments there without the others knowing what is said. Carter convinces Fifth to help them escape — his Replicator “brothers” won’t be destroyed by reversing the Asgard device, just frozen in time until the Asgard can figure out what to do with them. Fifth agrees, but with one stipulation: that SG-1 takes him with them. Carter agrees, and wakes up. The other Replicators have gone for now, giving Fifth time to access the time dilation device. Carter moves to set the clock to countdown. But if Fifth leaves immediately, the others will know he is gone and deactivate the device. He must stay while SG-1 runs to the Prometheus, and join them at the last minute — so that the Replicators do not have time to react to his absence and shut off the device again. Jack tells Sam to set the timer for five minutes, but subtly indicates only three minutes with his fingers. He cannot allow Fifth to escape the trap. SG-1 hurries back to the ship and takes off. First and the other Replicators arrive to confront Fifth, and First tells him how naive he is to think that the humans would take him with them. Fifth opens the device and looks at the timer — only seconds, not minutes, remain. “She promised …” he says. Time comes to a near stand-still as the device activates, trapping the Replicators. The Prometheus streaks through space — SG-1 has escaped. Jonas and Sam question O’Neill’s decision to use Fifth’s humanity against him, but Jack is adamant that there was no other solution.